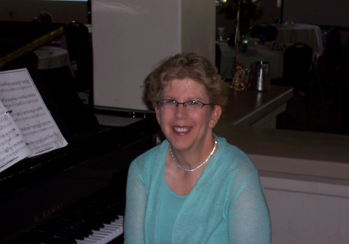 Marian Pease has taught piano in Oregon and Arizona for more than 30 years. Her formal education includes more than 20 years of piano lessons, most recently with university professors and performing professionals in advanced repertoire and pedagogue. Mrs. Pease continues to actively participate and perform in university classes, master classes, conferences, seminars, and workshops. By continuing education and assisting her students, Marian is constantly refining her teaching techniques and procedures. In her studio, she strives to create a climate in which each student can experience their potential with continual musical, intellectual, and emotional growth. Students thrive in this supportive, nurturing atmosphere that promotes excellence in music making. Recreational Music Making (RMM) for adults is an exciting new adventure for Marian. More information is available on the Adult Student page and in the LINKS. Along with keeping a busy studio and performing professionally, Marian is an active member of her church, and is on staff as a pianist and worship leader, working with acoustic and electronic keyboards. A new adventure for Mrs. Pease was training for, and completing in America’s Most Beautiful Bike Ride Century Ride (100 miles in one day!) in Lake Tahoe with Team in Training to Benefit the Leukemia and Lymphoma Society in 2011.This has led to a new love of road cycling, with continued training and charity events. Marian and her husband Mark have been married 39 years. Pacific Northwest, San Diego, anywhere with my grandchildren.